On the 12th July, Ofgem issued an open letter launching the process for establishing the next round of price controls, known as “RIIO-2”, for the GB gas and electricity systems. These price controls determine the amount of allowable expenditure for network companies (which includes owners and operators of the transmission and distribution networks) and the amount of returns they are allowed to earn from their regulated assets. The current price controls for electricity transmission operators are due to end on 31 March 2021, while those for distribution network operators run until 31 March 2023. Electricity network costs have been growing in recent years, contributing to increasing consumer bills – network costs account for just over a quarter of bills, making this a politically sensitive topic. Recent RIIO reports indicate network companies are earning returns of around 10% on average, double the average UK share return of 5%, which is questionable as these are low-risk businesses which would be expected to yield relatively lower returns. In 2010 Ofgem overhauled its approach to price controls and introduced RIIO – a consumer-oriented revenue-based incentive scheme designed to deliver innovation and delivery outputs. Where network companies outperform by innovating and delivering more cost effectively, this reduces costs to consumers and provides the companies with additional revenue. However, where outperformance arises from forecasting errors there are no consumer benefits. Ofgem believes that its forecasts for real price effects may in some instances to have resulted in gains for network companies, and that consistent outperformance through companies delivering outputs at lower costs than the allowances, suggests that the output targets could be tightened in the next price control. The other key component of company returns is the cost of capital. 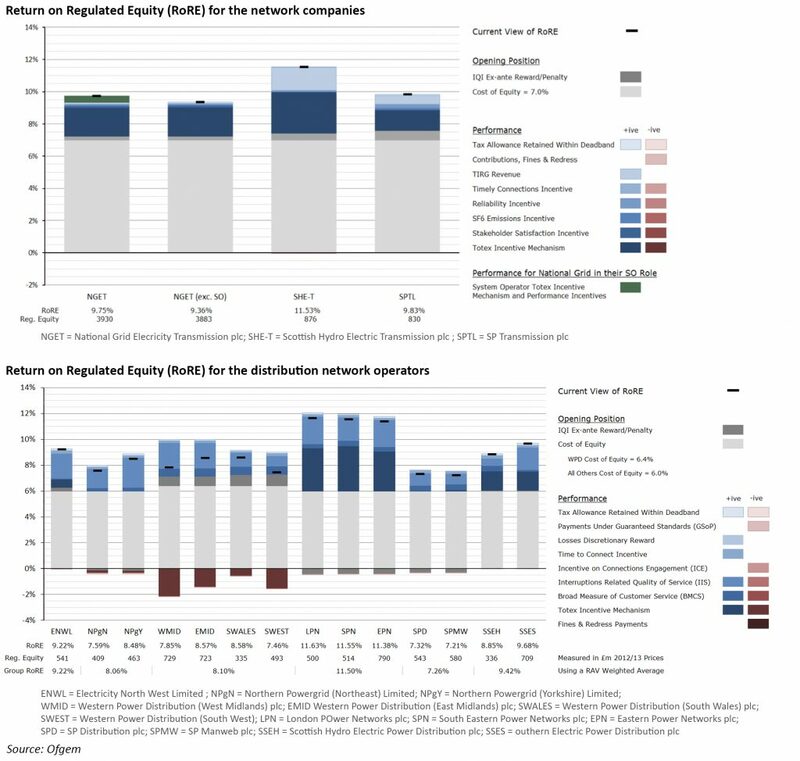 Since the RIIO-1 price controls were set, risk-free interest rates have fallen, and investor appetite for “safe” assets has led to high demand for regulated utilities suggesting that the real cost of capital for network companies has been lower than expected, leading to higher investor returns. The current price controls (“RIIO-1”) are the first generation of controls under this new framework, under which network companies have been allowed to recover revenues of around £96 billion over an eight-year period to provide safe, secure, reliable, low carbon and smarter network services. The 8-year price control period is designed to provide stability, but in a fast-changing market where new innovations are developing quickly, Ofgem recognises the challenge of accommodating a range of possible transformative trends such as blockchain and artificial intelligence, whose possible impact on the energy system is not currently predictable. For each transmission or distribution network operator, Ofgem reports their total controllable expenditure on maintaining and improving GB’s electricity transmission or distribution network infrastructure (as applicable), their allowed revenue for these activities, the impact of these allowed revenues on customer bills, and an estimate of the associated return on regulatory equity (“RoRE”) for investing in the electricity transmission of distribution networks. The outputs the transmission network companies are required to deliver fall into six categories: safety, reliability, availability, customer satisfaction, connections/wider works, and the environment. DNOs have a similar set of outputs: reliability and availability, environment, connections service, customer service, social obligations, and safety. At the end of the third year of the current price control period for transmission operators, all of the transmission operators expect to outperform their forecast allowances over the entirety of RIIO-1 by between 5% and 12%. The combined allowed expenditure for the TOs across the period is currently forecast to be £18.8 billion. Ofgem believes the underspend is due to a combination of a lower requirement for connections, smaller increases in prices compared with the assumptions used in setting the allowances, and slower growth in input prices (labour, material equipment/plant). In addition, National Grid reports that the actual cumulative level of system operator total expenditure is £23.2 million below allowances (£428.4 million) for the first three years of the RIIO-1 period (5%), and is forecast to be £18 million below adjusted allowances (£1,156 million) for the entire RIIO-1 period. Based on performance in the first year of their current price control period, the DNOs are collectively expected to underspend their expenditure allowances by £837 million (3%) over the entire RIIO-1 period, with eight DNOs expected to underspend, and six to overspend. The underspend was largely driven by lower expenditure on replacing and refurbishing equipment, and network capability, although this direct cost underspend was partially offset by overspend in three other direct cost categories: network faults, network inspection, and service quality. There was also overspending in the indirect cost category of operational support. According to Ofgem, it is not unusual for direct expenditure to be lower and indirect costs to be higher than expected at the start of a price control. DNOs may decide to re-profile their expenditure in light of their final allowances so Ofgem expects direct expenditure increase over the price control period. Some of these underspends will be shared with consumers through reduced bills, and the rest will contribute to company profits, either for re-investment or distribution to shareholders. As the RoRE chart below shows, both the DNOs and TOs are earning returns above the average UK-company returns, in some cases by a factor of two. The FTSE All-Share returns for Apr 15 – Mar 16, the period corresponding to the latest RIIO annual review period, was 5.0%. Earlier in July, Citizen’s Advice issued a report, Energy Consumers’ Missing Millions, which found that network companies will earn between £3.5 and £11.1 billion pounds of excess profits during the current price control period. Ofgem structured RIIO-1 so that the best performing companies could earn double-digit returns while the worst would only earn enough to cover their cost of debt. Instead, according to Citizen’s Advice, the average profit is 10% and none earns less than 7%. The financial incentives Ofgem put in place to reward efficiency delivered rewards because staff and materials costs were significantly lower than forecast, generating a £1.1 billion benefit. Ofgem rejects this analysis, although it concedes that the report raises some important points, and recognises that the risk-free rate and cost of capital were lower than expected, leading to better outcomes for the network companies. Ofgem has signalled strongly that RIIO-2 will be tougher reflecting what it sees as strong evidence that investors are willing to accept lower returns on these assets. RIIO has been strongly criticised for allowing network companies to generate above average levels of returns on businesses that are seen to be less risky than the wider economy. Ofgem itself accepts that there is room for improvement, and has signalled that the next price control round will be less generous, and there are calls for the regulator to move away from attempting to develop long-term cost forecasts in favour of greater cost-indexation. There have also been criticisms that RIIO has not provided enough of an incentive for DNOs to innovate, and suggesting that in relation to innovation the process is little more than a box-ticking exercise. This is disputed by the Energy Networks Association, however, Ofgem has identified a number of flaws in the current system in relation to innovation which it is addressing in its network innovation review. These include projects which either do not focus on the network (instead focusing on electricity generation), or are projects which ought to be considered part of the network companies’ business as usual due to licence obligations such as keeping industry codes/standards up to date. However, if the underlying assumptions at the start of the price control period turn out to be too generous, consumers will suffer higher prices for an extended period, while investors will enjoy excess return for a similar length of time. This effectively further de-risks an already low-risk business for investors. Ofgem should re-consider whether a long price-control period is in fact in the best interests of consumers, or whether there are more cost-effective means of deterring short-term behaviours by the network companies. Setting long price control periods with different time horizons for different parts of the system is counter-intuitive, particularly in light of the speed of change in the market. The activities of DNOs are becoming less passive, with increasing amounts of distribution-connected generation, the growing role of aggregators delivering demand-side response services, and the expectation of increased levels of storage on local networks. All of this impacts the transmission system, which is also facing the challenges of large volumes of transmission-connected renewable generation and the loss of large thermal plant, suggesting that a more integrated approach to network management would make sense. Shorter price control periods, with harmonisation between the transmission and distribution components would be an improvement, together with more robust cost controls and allowable returns that better reflect the fundamental business risks of operating regulated, strategic assets. The next generation of price controls also need to support effective, whole-system innovations that deliver genuine benefits, particularly in the areas of system stability and reliability, as these are arguably most under threat as the penetration of renewable generation grows. Neither Ofgem not the network companies is responsible for the policy decisions that are leading to the significant market changes that are underway, however both have a responsibility to ensure that the electricity system is secure and reliable and that costs are properly controlled.